Thank you so much for starting this foundation. In my neighborhood, the same group of girls get together and think of a great charity to donate the money we raise. This year, for our 5th annual lemon”aide” stand, we wanted to help Africa. We all know how many problems people in Africa are having. We were inspired by two young children, adopted from Ethiopia, Danny, 4, and Mary- Kate, 2. Their mother introduced us to this huge problem: dirty water. We were shocked to see how some people have to drink dirty, contaminated water and walk miles and miles to get it. We agreed, unanimously, that bringing water to Africa would be our mission this year. Jessie researched reliable charities that we could donate the money to. Jessie found you, the Water Project and immediately sent me your website. We were all set to have the lemon”aide” stand on Friday the 19th of June. In the morning we could not believe the rain, even hail! We were all biting our nails hoping that it would turn out. All of our hopes and prayers obviously worked. We had the most beautiful day, so hot three of us had to jump in the pool, reminding us again how much we appreciate fresh, clean water. All day we told people about your charity and they continued to donate. One women donated 20 dollars, because she was from Africa. Jessie was so moved that she contributed a whole week’s worth of her dog walking money . We loved to hear, “Keep the change” over and over. 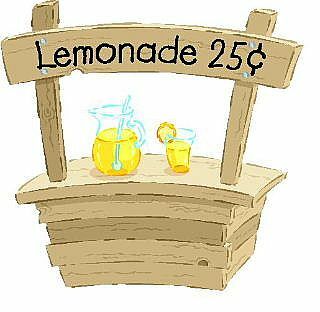 We only charged 50 cents per lemonade and it all added up to $135 dollars. We hope that the customers from our lemon”aide” stand will continue to donate to The Water Project.